The Anonymous Shawn Speakman says: I want a set of these. Badly. At first glance, they looked great. Then looking at the feedback from people who've got the first book, they look a bit overpriced and dodgy in quality. I think that if I ever go for a hardcover set, I might just go for the American standard editions. They appear to be better quality than these ones. Brit publishers sure are committed to their crappily constructed bindings, eh? I have a friend who went out of her way to brag that she never bought a Harry Potter book until the British box set was out, because they are "better." Bad example, of course, since the U.S. editions of HP were glued too, but the vast majority of books printed in the U.S. are much better quality. Even trade/MMPB editions generally use better paper. Sorry to nitpick, but you say that Feast features the Greyjoy stag on the cover. I know it's a typo, but for the rest of my days I will tell the tale of how I corrected Adam Whitehead about something related to ASOIAF. Yeah, British hardcovers are appalling. Some are actually okay (my 1,150-page NAKED GOD hardcover has survived 4 read-throughs with no problem) but a lot of glued books are rubbish and start falling apart: my DREAMSONGS hardcover didn't even survive one read-through before pages started falling out. However, the black-covered Gollancz 'superior edition' hardcovers are also very good in quality, despite being glued. That said, I've found American paperbacks to be poor. They're physically smaller than British A-class paperbacks, which makes bending or breaking the spine almost unavoidable, particularly on thicker books, and the pages often smudge if you so much as look at them in a funny way (Tor and Del Rey books are particularly bad for this). Damn! I was looking forward to something like this. Too bad this looks like it's crap quality. 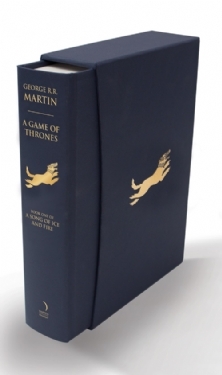 Eventually I want all 7 (or 8) books in a nice sturdy edition like this one first seemed to be. I guess I'll just wait till the series is done and see what pops up on the market. I'm sure more than one publisher will want to put out the whole series in an edition with great quality. Having got one of these, the quality isn't amazing no - but no worse than I expected and it is very pretty! overall, I'm glad I have Thrones in the format, but doubt I'd buy the rest unless I get more bookshelves. Also, I'm not sure I'd have spent £40 on it when there's other books at the Folio Society I'd prefer to spend that on, but given Amazon had it almost half price I'm happy enough! I usually have the opposite reaction to British paperbacks as you Adam. Nearly every Gollancz trade paper I get the spine cracks even when I'm very careful while that hardly ever happens with the US version. Mass markets are a different thing, but they're made to be cheap. I'm spoiled by the quality of German books - both hardcover and paperback. Neither US nor UK versions come close. I've never had to replace a German book, not even my much read favourites, while I had to rebuy several UK/US books after the second read. I tend to prefer US paperbacks for the size alone, it's so much more convenient than the UK mid size. I have had the smudge, blur issue with some that use really thin paper, but I've never suffered the cracked spine thing with any of my books, no matter the format. Maybe I take too much care with my books. I once loaned a paperback to a friend, he read it and returned it to me asking if I'd actually read it, because he couldn't believe the condition it was in. From where i can buy those editions?